Again if you follow my Twitter and or Facebook you would have seen the many picture of my Hobbits and of me with my better half ;). So aside from doing all my press work at the Comic Con, I made sure to spend just the same amount of time with them. This was my Hobbits first Comic Con and boy were they taken back haha. Both of them running back and forth trying to find the heroes or villains they want to meet. Jackson would get so pumped up about meeting one and then get SUPER nervous haha. That’s all I heard most of the day haha. We did get some really good picture of them tho and they powered through the whole Con, from beginning to end. We were all tired and our feet were killing us…. Plus we still had to drive back home haha. But It did make for some great memories and the kids in a state of wonder :). Like I wrote about in my other post called “A Small Conversation With William Shatner & Bob Camp At Wizard World“, they were able to meet William Shatner. As well as some of the artist in the area. Lilly Got to meet her Disney princesses and Wonder Woman, Jackson got to meet Darth Vader and The Doctor. Plus a number of zombies haha. The cosplayers were in the area were so nice to them and again the staff was great. We did try and set through a few Q&A panels, but you know who that goes :). They did really well, no yelling or moving around to much. But when you don’t know the topic to well things get a little hard to set through. But over all I think they did really well and I can tell they had a lot of fun. I can’t wait till next year and have the kids a little bit more older. Till then so long, and thanks for all the fish! 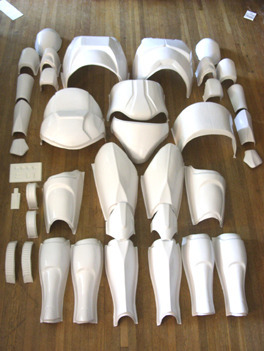 Ever wondered how to make your vary own Storm Trooper outfit? Well thanks to Cosplay 101 Tips you can!